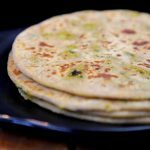 Gobi paratha or cauliflower paratha is one of the most popular stuffed paratha recipe in India. 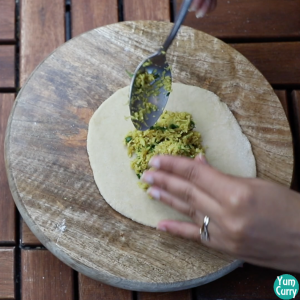 I have also prepared some more stuffed parathas like tandoori aloo paratha and palak paratha or spinach paratha. 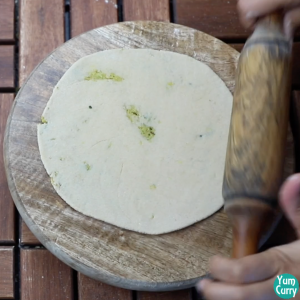 This is a gobi paratha recipe with step by step photos and video recipe. 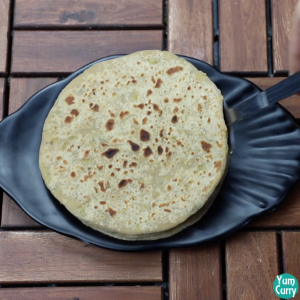 Some people prepare this gobhi or gobi paratha without frying the gobi or cauliflower and some prepare it by frying the gobi with all the spices. I like it both ways. 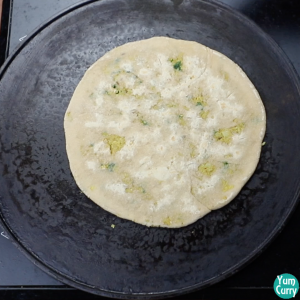 Frying the gobi gives a nice balanced flavour of spices to gobi paratha. 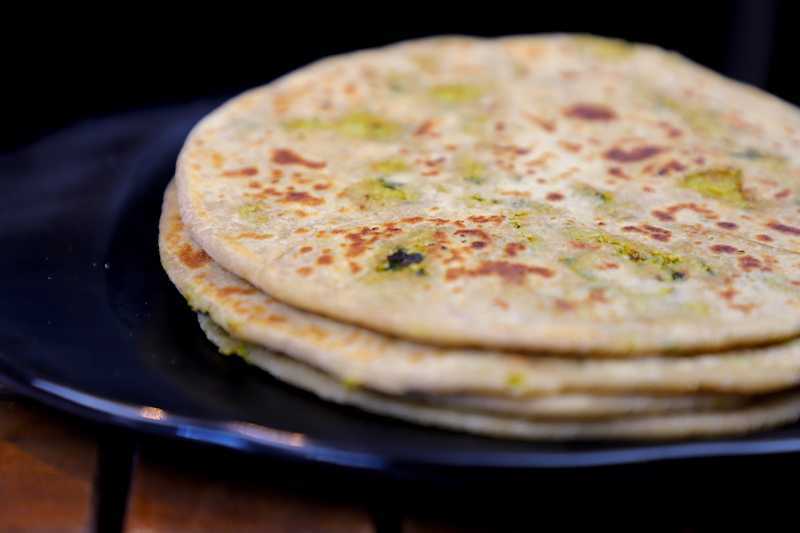 Cauliflower paratha or gobi paratha is very healthy as well. 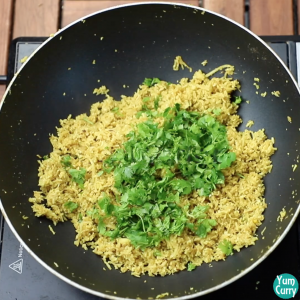 As gobi or cauliflower is rich in fibre and it improves heart health. It is also rich in omega 3. That’s why do not feel guilty when you eat gobi paratha. 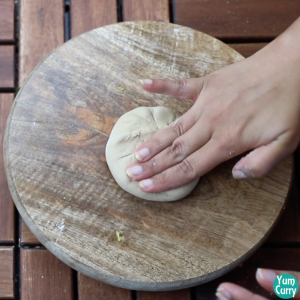 Hope you like this recipe from my kitchen. Please like and share with you friends and family and let me know how do you like it in the comment section below. Enjoy! 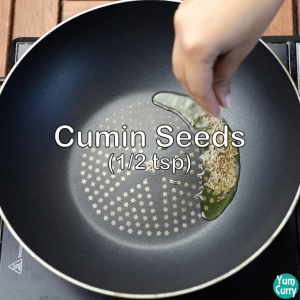 Add cumin seeds to it. Sprinkle some hing in it. 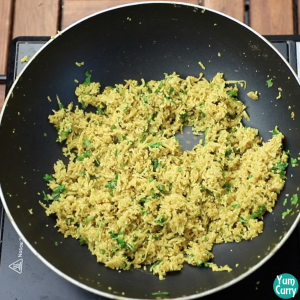 Add grated ginger and finely chopped green chillies to it. Mix. 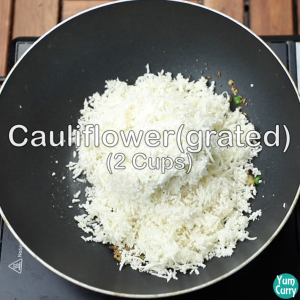 Add turmeric/haldi and grated cauliflower to it. Mix well. 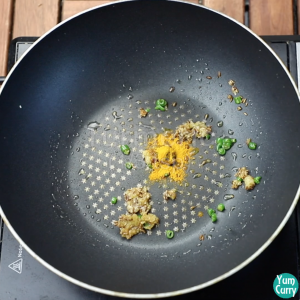 Add chilli powder, coriander powder, garam masala, amchoor (dry mango powder) and salt to it. Mix well. 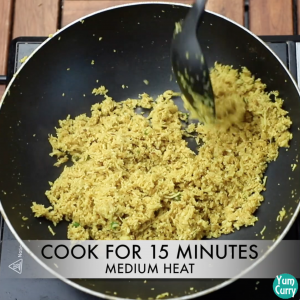 Cook this on medium heat for 10-15 minutes. Stir occasionally. At last add chopped coriander leaves to it. Mix well. Turn off the heat and let it cool. 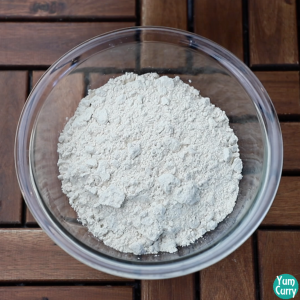 Take wheat flour in a deep bowl. Add salt and oil to it. Mix well. 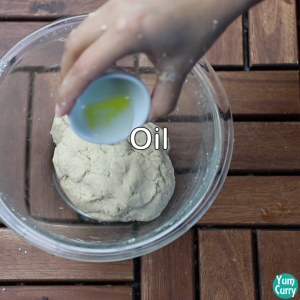 Add water and knead to make soft dough. 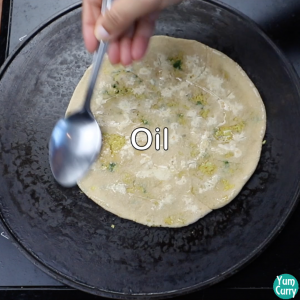 Apply some oil on top of the dough and cover it with a cloth. Rest for 10 minutes. 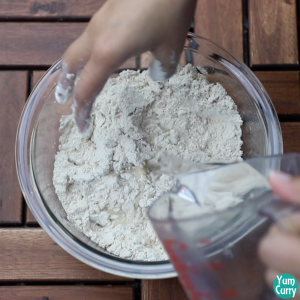 Take a small portion of the dough and dip it into flour. Roll it a little. 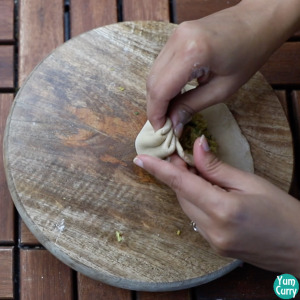 Now add the prepared filling in it and seal it by making pleats. 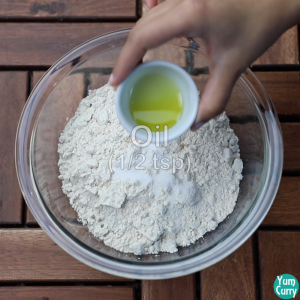 Now dip it into flour and roll it thin. 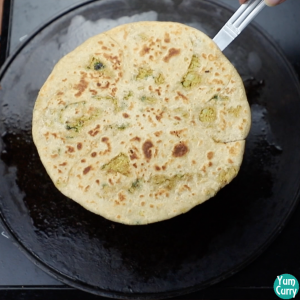 Transfer the paratha on the hot tawa/pan. Cook for a minute then flip. 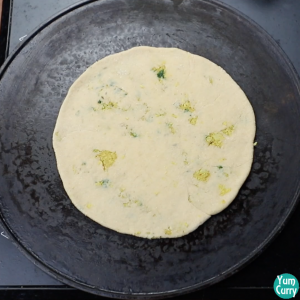 Add some oil/ghee on both side of the paratha. 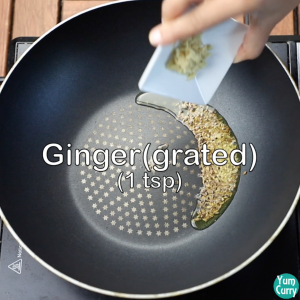 Cook it from both sides until done. 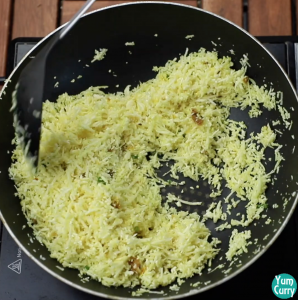 Serve it hot with chutney or curd. 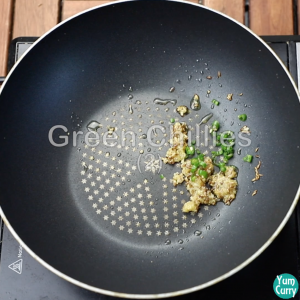 Heat oil in a pan and add jeera/cumin seeds to it. Let it crackle. Add hing to it. Mix. 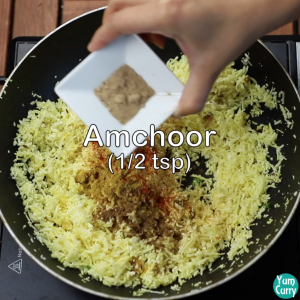 Now add all the spices, chilli powder, coriander powder, garam masala, amchoor and salt to it. Mix well. Cook for 10-15 minutes on medium heat. At last add finely chopped coriander leaves to it. Mix well. Let it cool. 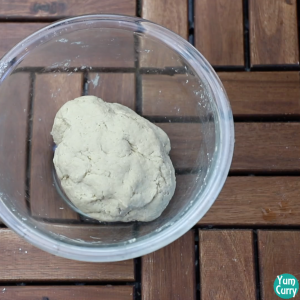 Take flour in a bowl. 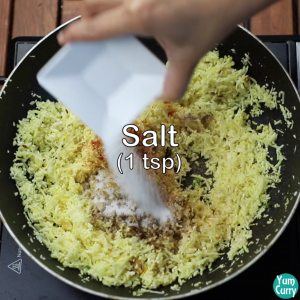 Add salt and oil to it. Mix well. 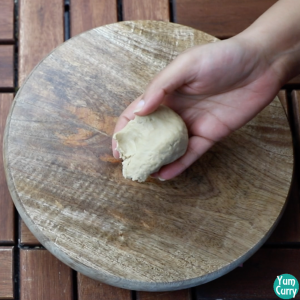 Add water and knead it to form soft dough. 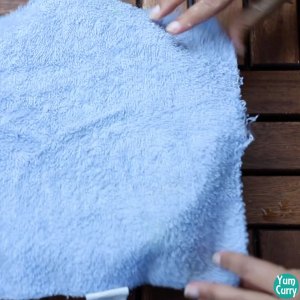 Add oil on top of it and cover it with a cloth. Rest for 10 minutes. 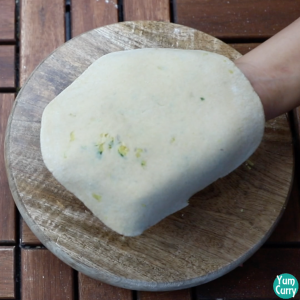 Take a small portion of the dough and roll it a little. 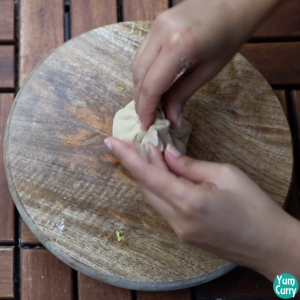 Add the filling to it and seal it by making pleats. 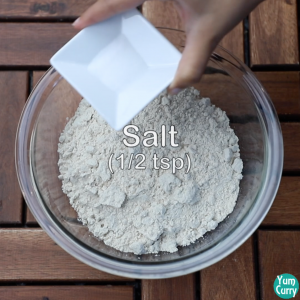 Dip it into flour and roll it thin. 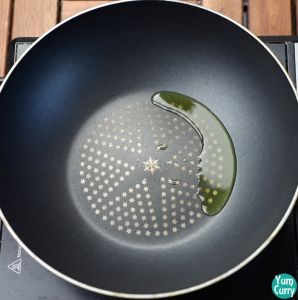 Transfer it to the hot tawa/pan. Cook for a minute then flip. 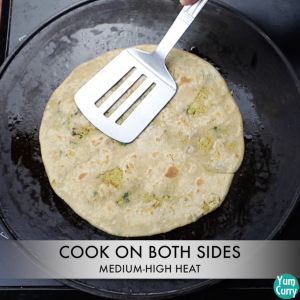 Add oil on both side and cook the paratha from both sides.